Other sources from the Alliance to Support Egypt coalition, who spoke to Mada Masr on condition of anonymity, confirm Qasabi’s account of the proposed amendments, telling Mada Masr that Sisi will be able to run for elections after his second term concludes in 2022, which could keep him in office until 2034. However, there has been a concerted effort to circumvent constitutional limits on presidential power in recent months. The proposed amendments also included the establishment of a “High Council for the Protection of the Constitution,” a body that would have far-reaching powers to “protect the identity” of the state and safeguard national security in case a new political leadership was to take power, the source told Mada Masr. The focus on “national stability” was echoed on Sunday by Qasabi. “The amendments are necessary in order to maintain stability and continue development plans,” the MP told parliamentary journalists. Qasabi also suggested that the political will to amend the constitution extends beyond the Alliance to Support Egypt and encompasses prominent political voices and forces, all of whom are in agreement in “preserving the achievements” of the 2014 Constitution. Through the proposed changes, Qasabi stressed, the Constitution will afford more liberties and guarantees. “These amendments serve the Egyptian people and the higher interests of the state ,” he concluded. According to the sources in the Alliance to Support Egypt, the amendments will tackle several other issues beyond the presidential term limits, including allowing the president to appoint at least one vice president; reintroducing two state bodies effectively dissolved by the 2014 Constitution: an upper house of Parliament — formerly called the Shura Council but now to be called the Senate — and the Ministry of Information, which will replace the national authorities for press and broadcasting; and stipulating a 25 percent representation quota for women in parliamentary elections, with “adequate” representation for youth and Coptic Christians. This is in addition to adding an article that will make the Armed Forces “responsible for protecting the civil state,” the sources add. After the submission of the proposal, the next logistical step will see the suggested amendments referred to Parliament’s General Committee — which is overseen by Abdel Aal — within seven days, as per Article 141 of the parliamentary bylaws. 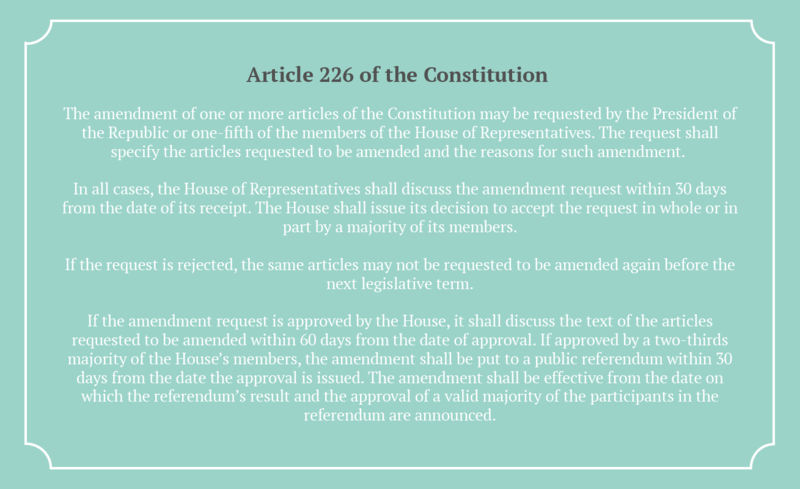 The committee will be tasked with reviewing the proposal’s adherence to specific terms and conditions, as outlined in Article 226 of the Constitution and Article 133 of the parliamentary bylaws, and preparing a report to be handed back to the legislative body. “During the [next] general assembly debate, I will allow everyone [in Parliament] to express their opinion. The Legislative Committee [will then be able to discuss the matter with everyone] from inside or outside the house, including all political parties and forces,” the speaker added. Qasabi’s submission on Sunday was preceded by a meeting held by the Alliance to Support Egypt coalition on Saturday to finalize the proposed amendments, where senior coalition officials collected signatures from MPs representing political affiliations inside and outside the coalition. Several rights organizations have denounced recent calls from Sisi’s backers to amend the Egyptian Constitution to allow him to stay in power. The issue was also raised during a meeting between a number of human rights representatives and French President Emmanuel Macron in Cairo last week. Following the meeting, Mohamed Zaree, the director of the Egypt office of the Cairo Institute for Human Rights Studies who attended the meeting, told Mada Masr that he hoped the meeting would result in an international response to discourage the proposed constitutional amendments.